Happy New Year from IATCB! We would like to congratulate Denver Zoo’s new CPBT-KAs: Carly Levell, Heather Lester, Janna Dewey, and Andy Schertz. They let us know how they prepared for the exam! This summer, four members of our Animal Ambassador team at Denver Zoo decided to take the CPBT-KA examination. We were excited to demonstrate our training knowledge and also looking forward to keeping up to date with the newest information through CEUs. Denver Zoo gave us so much support: not only in the cost of the exam and reading materials, but in the time to prepare for the test through group study sessions. We utilized the content outline in the handbook, taking turns reading the books and articles and adding to our growing study guide. We spent our weekly group time discussing outline topics and making sure we all had a good understanding of the principles, even making digital notecards and quizzing each other. The four of us were nervous on test day, but felt well prepared. All of our hard work paid off and we passed with flying colors! Becoming certified shows our dedication to providing the best care possible for our animals by using scientifically founded, positive training methods and approved husbandry methods. At the beginning of the year, our Ambassador team sat down together and came up with a “why” statement: why we do what we do. What we came up with was this: “To engage and inspire people so that they develop a deeper connection with animals.” Being CPBT-KA certified holds us to the highest standards of training, care, and interpretation techniques and allows us to fulfill our “why” and the zoo’s mission through our behavior-based programs. 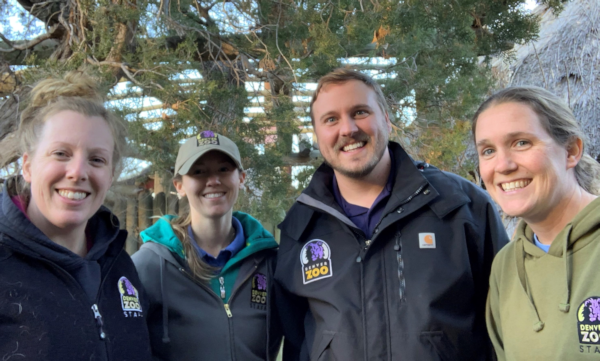 Having several certified trainers ensures we will continue to give our guests the best experiences, leaving Denver Zoo with a greater appreciation for animals and wild places. There are only 19 days left to get your application in to take the test! Did you see this post on the Owl Research Institute? Do you know what kind of owl this is? If you guessed Barred Owl, you’re right; however, it’s far from typical! This is a unique melanistic Barred Owl captured on film by photographer John Horton in the southern United States recently. Melanism is a genetic mutation that causes the excessive production of melanin in animals, often causing them to be entirely black. Melanism, the opposite of albinism, occurs in birds, amphibians, mammals, and reptiles. In some instances, melanism seems to be a product of natural selection, improving an animals’ ability to retain heat or blend in with its surroundings. Melanistic animals can appear so different that they are sometimes mistaken for an entirely different species. "I was out looking for raptors to photograph. It was early morning and I noticed movement in my peripheral vision. I turned my head to see something fly into some trees. When I looked into that area, there it was with its back to me, looking over its shoulder. It turned around, shook its feathers out, then turned and looked at me again before flying off." "From my first shutter release to the last was a total of 24 seconds. At the time, I knew I was looking at something different but I didn't know what. 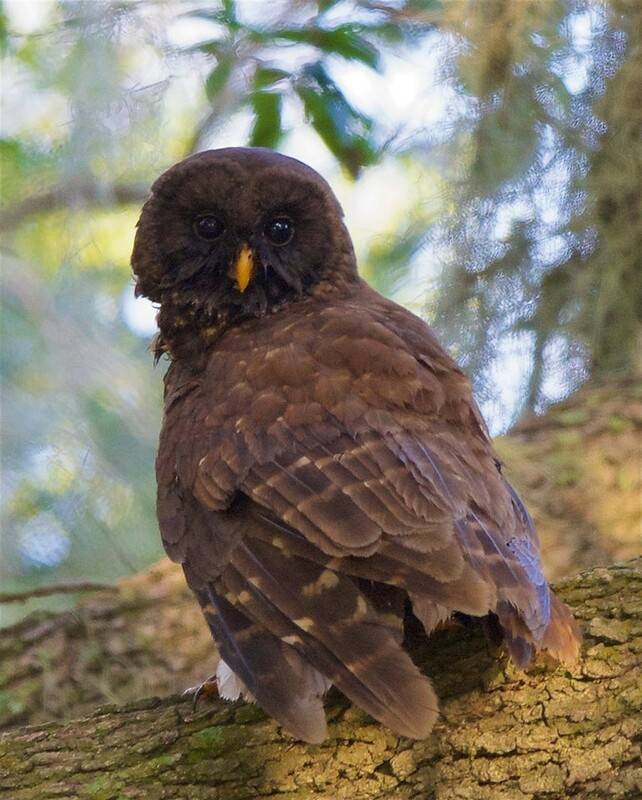 Once I got home and looked at the images, I realized I was looking at a very dark Barred Owl (especially when you look at it’s left foot with the white feathers)." Equipment used: Nikon D5 and a Nikon 600 f/4E, hand held. Initial ISO of 64,000 and by the end of 24 seconds I had gotten the ISO down to 2500. A huge thanks to Jack Horton for sharing this photo - letting us share it with you, and for including his story! Virginia opossums (Didelphis virginiana) have a wide range throughout Central and North American, which continues to expand. Virginia opossums may be found in a fairly wide range of habitats; however, they typically prefer areas near a water source, such as a stream or swamp. These animals may live in woodlands and thickets but they are very often found within human altered areas. This species has been extremely successful due to their ability to thrive in urban areas; this is assisted by their small body size, nocturnal habits and high reproductive output. Virginia opossums nest in brush piles, hallow trees and drainage areas. 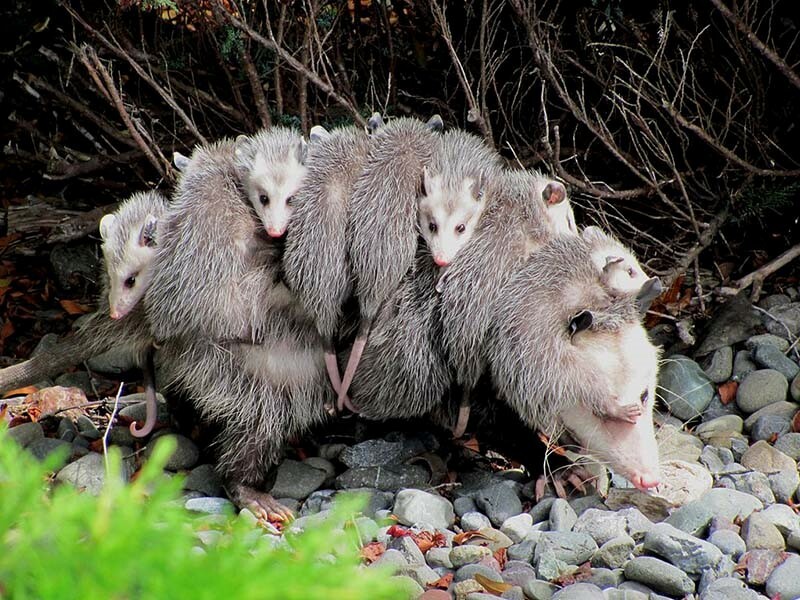 Virginia opossums are robust marsupials, with short legs and thick bodies. Their pelage is typically grayish, but it may range from a reddish, brownish or even blackish hue. Their coloration may vary based on the range of the population; for instance, northern populations tend to have lighter guard hairs, thicker under fur and a more grizzled appearance, whereas southern populations generally appear darker and have thinner under fur. They have large delicate ears, which are predominately furless, making frost bite to that region extremely common. Likewise, their long tails are also common victims of frost bite. Although there is fur at the base of their tail, it is largely hairless throughout. A few years ago, scientists wanted to learn about the part different mammals and other animals play in the spread of the ticks and Lyme disease. One study (https://www.offgridquest.com/wildlife/did-you-know-that-possums-eat-almost-all) of six species of animals (white footed mice, chipmunks, squirrels, opossums, veerys, and catbirds) tested the creatures by exposing them to ticks. When it was all said and done, one of them showed a remarkable skill: the opossum was amazingly good at removing them... and eating them! Opossums are crazy, fastidious, grooming animals like cats, and when they find a tick, it's right down the hatch. Researchers found many digested ticks in the feces of cooperative opossums. Cheers to the guy who got that job! Ostfeld said that one opossum can kill and eat some 5,000 ticks in a single season. While they can't get them all and certainly get bitten by a few, opossums will destroy some 90 percent of all the ticks they encounter. Knowing the effects of Lyme disease maybe the little mammals will get a better rap now in the animal world.